Arkansas’ campus carry bill HB 1249, has expanded into an enhanced carry permit bill. It has become law, and goes into full effect on 1 January, 2018. Originally, the bill was to allow staff at institutes of higher learning, who had a concealed carry license, to carry on campus. Staff would have been required to notify the administration that they were carrying. The higher education lobby worked hard to stop this bill. One of the talking points was that people were not trained enough. 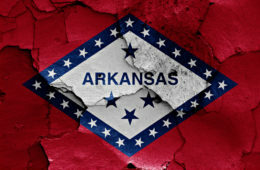 It seemed as if Governor Hutchinson might veto the bill. It all backfired on the anti-Second Amendment lobbyists. A much expanded bill was approved in the Senate. Then it was re-approved in the House, and signed by Governor Hutchinson on 22 March. Restaurants that serve alcohol, churches, and private institutes of higher learning may exercise their private property rights to prohibit armed people. They are allowed to do so with the placement of proper signage. The signage must be clearly readable at a distance of 10 feet. (iv) Cost no more than a nominal amount. The training should be available as of 1 January, 2018. The NRA has come a long way from the days when they merely tried to limit the damage done by bad bills. Many people fought hard for this bill, and the NRA did its part.